Wall mount adjustable keyboard holder(model #60219W series) - Sallas Industrial Co., Ltd.
Sallas - wall mount adjustable keyboard holder is designed to support a compact metal keyboard clamp. 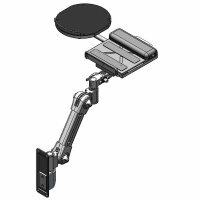 The clamp allows to hold any sized keyboard and to be mounted with a minimum profile yet still offers side-to-side, up-and-down and platform tilt mobility. 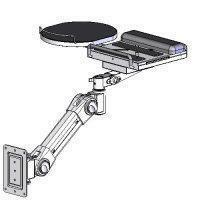 Patented counter force balanced and adjustable friction designed support arm provides personalizing usage for a most smooth and effortless adjustment - without the need to touch any knob or levers.